Crunch Gym is located adjacent to the east end of Simi Valley Town Center, at 2655 Erringer Road. The facitlity offers an array of fitness equipment, pool, tennis courts, racquetball courts, studio cycling, yoga/pilates, over 100 weekly group fitness classes, childcare and more. Visit www.crunch.com/locations/california/simi-valley/simi-valley or call 805.522.5454 for more information. Founded in 1988, Channel Islands Scuba is the oldest scuba facility in Ventura County. This is a store located in Thousand Oaks that provides weekly classes for adults (and snorkeling for kids), private lessons and vacation programs. Channel Islands Scuba is located at 2955 E. Hillcrest Drive, #101, Thousand Oaks. Visit www.cisdivers.com or call 805.230.9995 for more information. Channel Islands Kayak Center has provided kayak rentals, lessons and tours at Channel Islands Harbor and Ventura Harbor since 1997. Visit www.cikayak.com for more information. Channel Islands Kayak Center is located at the Channel Islands Harbor at 3600 S. Harbor Blvd., Suite 213, Oxnard (805.984.5995) and at the Ventura Harbor (by appointment only) at 1691 Spinnaker Drive, Ventura (805.644.9699). Conejo Valley Multisport Masters (CVMM) brings high quality adult swimming and multisport (swim, bike, run) programs to the Ventura County and Los Angeles County regions. Led by 2009 United States Masters Swimming Coach of the Year, Southern Pacific Masters Association 2008 Coach of the Year, Nancy Kirkpatrick Reno, the CVMM program is recognized nationally and internationally as the place to go for the best in coaching for swimming and triathlon. Year-round workouts available. Serves the communities of Thousand Oaks, Simi Valley, Westlake Village, Malibu, Newbury Park and Agoura Hills. CVMM trains at pools in Thousand Oaks, Simi Valley and Westlake Village. CVMM has all levels of adult swimmers and multisport athletes 18 years and older from beginner to elite, fitness athletes to World Champions. Visit www.conejovalleymultisportmasters.com to learn more. Blue Ocean Kayaking welcomes you aboard the “Sunfish,” a custom built supported kayak vessel. The boat has a special built swim step for very easy boarding. All kayaks are stored overhead, so there is no clutter on board. Professional kayak guided tours of Channel Islands National Park, Anacapa Island. Paddle through caves and seal rookeries on this family fun tour. Includes kayak, gear and boat ride. Located at Channel Islands Harbor, 3600 Cabezone Circle, Oxnard. Visit www.blueoceankayaking.com or call 805.204.0977 for more information. 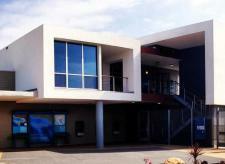 The Channel Islands Boating Center is a facility that provides educational and recreational opportunities for students of California State University, Channel Islands and Ventura County residents. Programs include teaching boating skills and providing educational opportunities about the marine environment. The Waterfront Program at the Center offers various instructional and safety classes in kayaking, sailing and windsurfing. These programs may be instructional, recreational or competitive in nature to promote and encourage recreation to all campus and community members. The program is dedicated to promoting boating safety and education, and is partially supported through funding from the California Department of Boating and Waterways. The Center is located at 3880 Bluefin Circle, Oxnard. Learn more at www.ciboatingcenter.org or call 805.985.6100. The Leo Robbins Community Sailing Center, located in Marina Park at 2950 Pierpont Boulevard is a U.S. Sailing Association Community certified non-profit facility. The Sailing Center provides youth and adult sailing courses, coastal and celestial navigation, passage making, kayaking, youth camps and safe boating courses year-round for beginning through advanced students. Classes are taught on a variety of boats from Sabots to a Catalina 30. The City of Ventura Department of Parks, Recreation and Community Partnerships has managed and maintained this community sailing facility since 1972 with support from the Maritime Foundation. Instructors are U.S. Sailing & American Sailing Assn. certified. For more information on lessons, hours of operation, or special group outings, visit www.cityofventura.net/sailkayak or call 805.643.3612. The Pierpont Racquet Club at 550 Sanjon Road, Ventura offers 12 tennis courts, 2 indoor racketball courts, squash court, indoor/outdoor swimming, gym/fitness facilities, personal training, aerobics classes, child care and a whole assortment of other services. For more information, visit www.pierpontrc.com or call 805.648.5161.